Who are the Old Colony Mennonites, and why are the Amish helping them improve their schooling? Ohio Amish church member Rebecca Miller returns today with some background on the people, and how the Amish became involved in educational outreach south of the border. 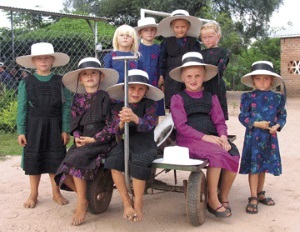 Twenty years ago a program was started to help the Mennonites in Mexico with their schools. First I’d like to give a bit of a history of these people. They are from the same background as the Amish and Mennonites in the USA and Canada. In the 1530s Mennonites moved to Poland by boat and were not permitted citizenship or allowed to have their own schools. In 1642 the Polish king demanded annual payments for the right to live in Poland. When war broke out in 1772, laws were passed to keep them from buying more land in Poland. They also needed to pay large amounts of money for military exemption. Marriages performed by Mennonite ministers were not recognized and both the state and the Lutheran church demanded large tithes. Their future in Poland looked bleak, so in 1780s when the Russian rulers invited them to settle the Ukraine, and offered religious freedom and military exemption it seemed like an answer to prayer. In 1778 they started migrating to Russia, which went on for the next 50 years. Schools were a low priority. Eventually the first colony was called the “Old Colony”. By 1850 they were so prosperous they were called the bread basket of Europe. But all was not well. The natives were irked at these German speaking people, threats were being made to revoke their military exemption, and Russian had to be taught in their schools. From 1874 to 1876 about a third of them left for North America, some going to the Midwestern states and some to Canada. It was a sad story for those that stayed behind – with war, murders, law break-down, theft and famine. In Canada they were promised freedom of religion, military exemption, the allowance to keep the German language. The first years were tough. Food was scarce. The government helped out, but schooling was neglected. When World War I broke out tempers flared against these German people. Their colony schools were closed in 1918, so again the decision was made to migrate, this time to Mexico. From 1922 to 1924 about 6000 Mennonites moved to Mexico on 36 chartered trains along with all their livestock, equipment, and disassembled houses. There were again many hardships with a different climate and a new frontier. Those that stayed in Canada gradually drifted into the surrounding culture and accepted the government schools. The visiting cousins from Canada, liberal and educated, made a big impact on the Old Colony people. They didn’t want to make changes, for fear of becoming too liberal and modern and losing the old way, therefore they let education slide. Eventually many of them couldn’t even read or write. Then in 1995 MCC (Mennonite Central Committee) contacted the Amish in the states to see if they could help these people, as most of them could only speak German. So a group of men from Ohio, Indiana, and Pennsylvania traveled to Mexico to meet with their leaders and to visit their schools and businesses. In 1996 a group of the Mexican Mennonite leaders traveled to the states to visit Amish schools, businesses, and churches. they saw a need for improvement in their colonies. They also had many questions about church and youth issues. In 1998 four men from the states visited Mexico to meet with school teachers and to help the ministry with issues they had in the church and with their youth. In May of 2000 three Amish teachers along with houseparents made their way to Mexico to teach. The first school was in Manitoba Colony. As of 2015 there were Amish teachers in seven different colonies in Mexico and one in Texas. Some of the teachers are very dedicated to this project and have been teaching there for many years. The schools are running smoothly and the children are eager to learn. The challenge now is to provide good reading material, as they have a great hunger to read. There are no mailboxes, no road signs, and no road names or numbers, as no one could read them. They have no mottoes or calendars on the walls, and there are no recipe books. they memorize all their recipes. What a blessing it is to see these innocent children growing up and now being able to read and understand the Bible’s teaching. They can learn right from wrong and live a clean God-fearing life, because they can read Jesus’s words and follow them. I’ve read stories of children being able to teach their parents to read. They also have Evening School for the adults now and English classes in the summer. Let us do our duty and pray for all involved, so that things may be furthered for the Kingdom. Thanks to Rebecca for sharing this inspiring story. If you’d like to read more about this special project, there is a book titled Called To Mexico: Bringing hope and literacy to the Old Colony Mennonites which goes into greater detail with first person accounts from those involved. Amish vary in their participation in mission work. For those Amish who are active, it’s more common to contribute closer to home. That noted, Mexico is not the only international location where Amish people are involved in outreach. WGAL news has a recent story about Mennonite and Amish volunteers in Iraq. Mission work & education is top priority! Here in america you will always have that comparison. Amish is far better than anything you can compare to the ordinary american households. There’s no need for comparison, why must we compare everything. I would think that at some point in our lives we will get sick of all the negative conversations, as well as the negative reminders!!!! Everyone is reminded of their past except white americans who migrated to america in a boat. The Amish, whether its Mennonites or not to me they are all the same humble people not to mention the nicest people you ever want to meet in America!